Before I travelled to Nepal and trekked to Everest Base Camp, I wondered how difficult the trek would be. What if my pack is too heavy? Will I be fit enough? What if I get altitude sickness? These were all questions I asked myself, and I’m sure you’re wondering the same thing if you’re planning on trekking to Everest Base Camp. There isn’t an easy answer to this question. The difficulty of the Everest Base Camp (EBC) trek depends on many factors. In this post, I’ll go over the factors that can make the trek difficult, and how I got around them and successfully made it to EBC. 1 What makes the Everest Base Camp trek difficult? What makes the Everest Base Camp trek difficult? The altitude is by far the most challenging part of the EBC trek, especially for people who haven’t been at high altitudes before. Altitude sickness doesn’t discriminate. No matter how fit, young and experienced you are, anyone can get it. Fortunately, it’s possible to get around the difficult altitude by acclimatizing. Ascend slowly is the best advice I can give for the altitude. By slowly, I mean that after you’re above an altitude of 3,000 meters, you shouldn’t gain more than 300 to 400 meters in sleeping elevation per night, and for every 1,000 meters you should schedule a rest day. If you follow this rule, you’ll reduce your risk of developing altitude sickness. Another great way to acclimatize better is to stay hydrated (Honestly, great tip for life in general). I recommend drinking four or five litres of water a day during your EBC trek. On top of drinking a lot of water, be sure to get 8+ hours of sleep per night and eat properly. It’s all about staying healthy so that your body has the energy to acclimatize! Diamox is a commonly used drug that your doctor might prescribe to you before you go to Nepal. It doesn’t completely remove the need to acclimatize (especially above 5,000 meters), but it does help a lot of people. Regarding Diamox, you should consult with your doctor if you’re interested in using it. I prefer to acclimatize naturally, so I haven’t looked into Diamox too much (But I did meet people using it on their EBC trek). When I trekked to Everest Base Camp, it was by far the longest trek I’d ever done. In total, you’ll trek about 130 kilometres and gain about 400 to 800 meters in elevation each day. Walking every day for 12+ days is tiring for most people. 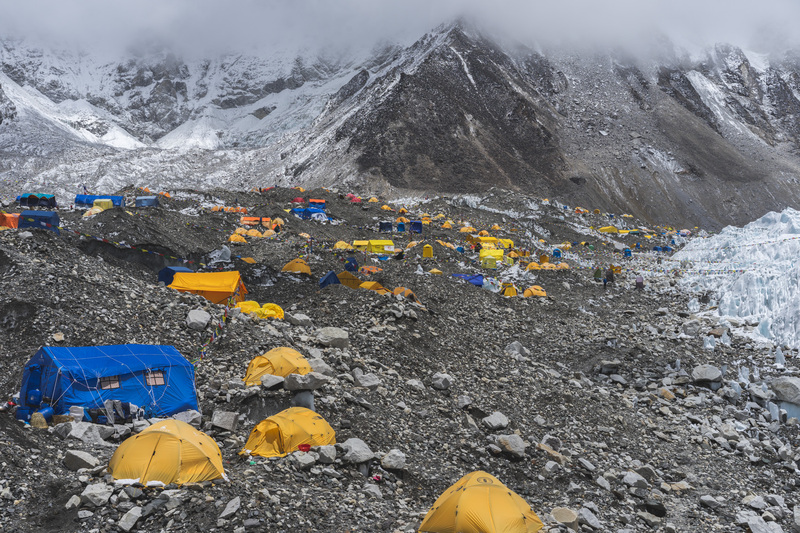 You need to put in a lot of work to be rewarded with the views at base camp, but they’re totally worth it! Along with the numerous walking days, the closer to EBC you get, the colder the temperatures will get. Depending on the time of year you trek, it can get pretty cold at night. During my journey to Everest Base Camp, I trekked without the use of porters – meaning I had to carry all of my gear on my back. Before your trek, try to lighten your load as much as possible. You don’t need to carry your city clothes up to EBC, just bring one or two sets of trekking clothes. You also don’t need multiple pairs of shoes; a good pair of hiking boots or trail runners will do just fine (add a pair of sandals if you wish). Trust me, when you’re at 5,000 meters in altitude every ounce counts. The alternative is to hire porters, which is a good idea if you feel you won’t be able to carry all your gear even after eliminating useless items. Would be a lot easier if one of these guys carried your backpack! Unfortunately, it’s fairly common to have to deal with stomach issues while on the Everest Base Camp trek. If you’ve just flown from a western country, your stomach is likely not used to the bacteria it may encounter in Nepal. There are a few things you can do to decrease your risk of stomach issues. First, take probiotics before your trip. These can help improve your gut flora. When you’re in Nepal, make sure to never drink unfiltered water. Yes – even that clear glacial stream you see likely has Yak dung in it. In Kathmandu, you can buy chlorine tablets to filter your water. Alternatives to chlorine tablets are Sawyer filters and boiling any water you drink. Even with the above strategies, you might still have stomach issues (I did). If you do, just take a rest day to recover. Drink lots of tea and be sure to get some electrolytes. Resting and recovering is very important so that you can get back on your trek as soon as possible! 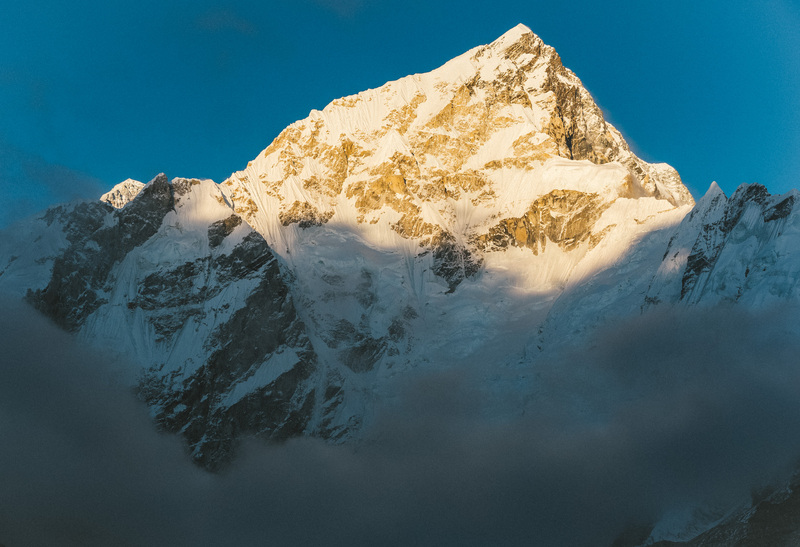 While the things I’ve outlined above increase the difficulty of the Everest Base Camp trek, there are a few things that you can do to decrease the difficulty. Proper training can make your trek much easier. You don’t need to do any crazy strength training, but having good core strength will help you balance when wearing a heavy backpack. It’s more important to train cardio. The EBC trek is basically just a long hike at high altitude, so great ways to train for it are by going on hikes, running, and cycling. Climbing up and down stairs is a good way to train if you have access to a tall building. When you’re getting comfortable with the hikes near your home, try doing them with a loaded backpack. It’s crazy how much tougher it can make them! If you train cardio in the months leading up to your trek, you’ll be in much better shape than the average person attempting the EBC trek. This is only an option for some people, but if you live in a place with access to reasonably high altitudes (3,000+ meters), you can get partially acclimatized before your trip. If you live in Colorado, you have a bunch of 4,000-meter peaks that are great for acclimatization. Understand that acclimatization only really lasts for about a week, so you can only do this type of training just before you leave on your trip. Avoiding bad weather in the Khumbu Valley is normally fairly easy. Plan to do your Everest Base Camp trek between the months of October and May. The summer is monsoon season and there will be a lot of precipitation. Avoid the winter months (December, January, February) if you don’t like cold weather. When trekking, start early each morning. During my trek in May, every day began with clear blue skies and then turned to clouds (and sometimes a bit of rain/snow) at around 2 pm. You don’t need to go and spend $500 on a jacket, but just be prepared for cold temperatures, rain, light snow, and wind. Any gear needed for the trek can be bought in Thamel (tourist district in Kathmandu) for very cheap. The one exception to this rule is footwear. While hiking boots can be bought in Thamel, it’s a better idea to buy them at home so that you have time to break them in properly. It’s wouldn’t be fun to be on day 2 of your trek and have your feet covered in blisters. Trekking to Everest Base Camp is something almost everyone is capable of. While it is difficult, proper preparation can help manage the difficulty. I hope this post helps you successfully complete your trek! Let me know if you do! If you have any questions, feel free to ask in the comments. If you’d like to read more, check out my journal-style post about my trek to Everest Base Camp!